A barefoot executives’ wonderland, Noosa is bursting with beaches, cafes, shops and restaurants all zeroing in on travellers. A costly place to holiday, it remains one of the best upmarket, informal and understated beach destinations in Australia. The best positioned of all the places to stay in Noosa, Netanya is a serviced apartment complex right on the beach with easy access to everything. 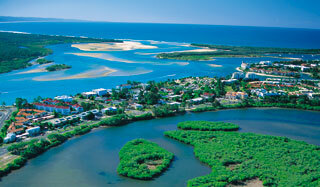 Noosa National Park is on your doorstep. You can spend an entire weekend without moving more than 50m from Netanya. The rooms are well equipped, modern and very well maintained. You have a choice of garden and beachfront apartments and studios. In the value for money stakes it’s not cheap, but you get a great place to stay in the best location in town. Another spectacular resort on Hastings St, the Sebel is a newer apartment hotel in the heart of Noosa. The suites, all one- or two-bedroom, are larger even than the Sheraton’s, and are set up with ample space and comforts to make the room feel like your own apartment and not a hotel room. There are areas for BBQs and a spa with an abundance of relaxing water features. Although some would say less water features and more pool would be an improvement – it’s too small compared to the number of guests. AT has read some not so favourable reviews of the Emerald Noosa – but if you know what to expect, this place is pretty hard to beat for the price. It’s not the newest kid on the block, but for a large complex with lots of rooms it’s surprisingly quiet, and any disappointment you might feel at the lack of modernity in the furnishings should be overcome by the sheer size of the rooms. When AT walked into our two-bed apartment, we thought we’d accidentally got the wrong room – perhaps one reserved for a travelling football team. Lounge, kitchen, cable TV, patio verandah, two large bathrooms with outstanding showers (important) . . . again, if you can handle the slightly worn feel, the Emerald, with its superb location, is absolutely for you. The best way to start your day in Noosa, the walk around the park is short enough to be enjoyable and long enough to be worthwhile. Most of us won’t see too much of the scenery since so much time is spent peering up in the trees to spot one of the many koalas that call the park home. The ranger’s hut at the main entrance to the park has a lot of helpful info, including perhaps the most helpful: where exactly is the best spot to spy a koala that day. Of the several walking trails here, the coastal track is perhaps the most enjoyable, traversing along the bay area and past the many beaches. Tea Tree Bay on the coast track is also a great place to take the little ones; it’s small and very safe with shade. To do a circuit will take about two hours and is rather strenuous. Be warned: Alexandria Beach in the middle of the park is used by the local naturalists. An extraordinarily relaxing way of sightseeing in Noosa, grab yourself an all-day pass (adult $17.50) so you can tootle up and down the gorgeous waterways past Noosaville and Noosa Sound as many times as you wish. Make sure you get a rooftop seat but don’t sit too close to the whistle, which the captain sounds at each stop (and any other time he feels like, usually for kids waving on the riverbanks). There’s a wonderful market and various jetty restaurants and shops at the farthest ferry stop of Tewantin, so a great idea is to catch it all the way from the Sheraton Resort Jetty behind Hasting St, then hop off quickly for a couple of takeaway beers at Tewantin (the captain will toot when it’s time to reboard), before idling your way back down the river. This round trip takes about 40 minutes and is full of houseboats, pelicans, gentle activity on-shore, as well as idle and interesting historic commentary from the captain.